Small-space dwellers, this one's for you. 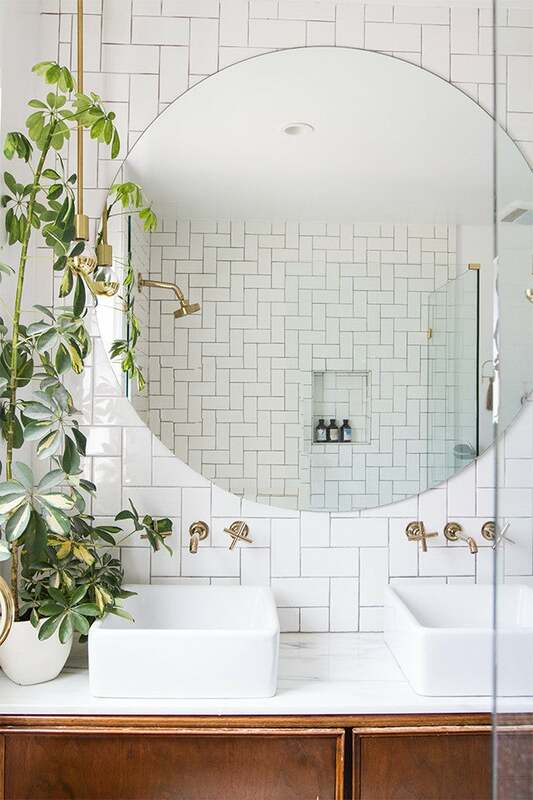 On our list of bathroom goals, you’ll find a his-and-hers bathroom situation pretty close to the top. While most small-space dwellers may not have the luxury of a double vanity, we drummed up a few clever hacks that are almost as good as the real thing. Take a look. Opt for a larger-than-average sink, which will allow for two separate faucet installations. A vintage or console sink may be your best bet if you lack the space for a large cabinet beneath. Tour the rest of this bathroom on Studio McGee. Browse local thrift shops or flea markets for a chest that can be easily converted into a vanity. This can significantly cut down the cost of investing in dual vanities or a sink cabinet. We’re loving this one designed by Sarah Sherman Samuel. Plan for extra storage space. Having your respective shelving area will not only prevent you from fumbling over your partner’s things, but it’ll help keep sink clutter at bay. Incorporate built-in storage solutions throughout or install a set of wall-mounted shelves for added space. Designate a spot for you. If you’re stuck with sharing a sink, factor in alternate decorative (yet functional) elements that will be unique to you and your partner. Separate towel hangers, personal mirrors, sconces, and storage baskets are only a few of the ways you can do so. In lieu of a bulky vanity, opt for a pair of free-standing or wall-mounted sinks instead. We’re taking major style cues from this Oslo bathroom, which manages to seamlessly integrate the dual look in one. Sometimes, a little optical trick can really go the distance. If a large vanity or double sink situation isn’t practical in your space, utilize a pair of mirrors set side by side, above the sink, to at least feel as if you have your own spot. How you do make the most of a tiny bathroom? Sound off in the comments below.